Co-Founder of Synopsys India Pvt. Ltd.
Arnob heads the Engineering function at Tejas Networks. 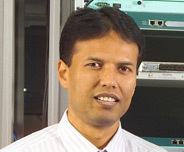 Prior to Tejas, he has held senior management positions at Synopsys Inc., and Cadence Design Systems. He was also a co-founder of Synopsys India Pvt. Ltd., a subsidiary of Synopsis Inc.
Arnob holds a Master’s in Computer Science from the University of Nebraska, Lincoln, USA and a Bachelor’s in Technology in Electronics and Communication Engineering from the Indian Institute of Technology, Kharagpur.